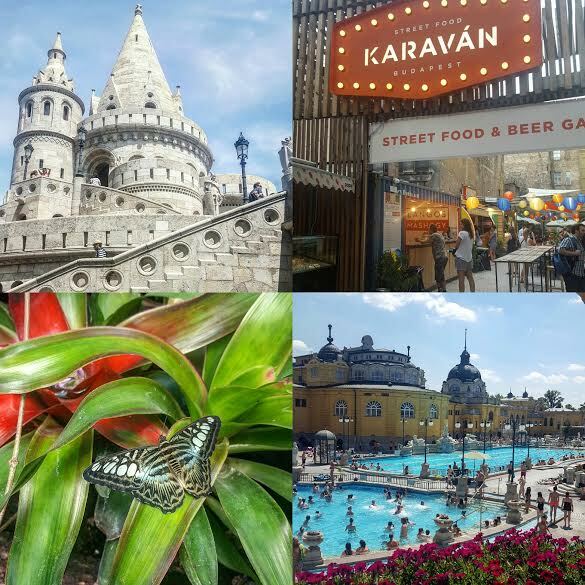 I've written a few travel blog posts but I think they often waffle on a lot and let's face it people can't be bothered to actually read them so this time I'm gonna try something shorter with giving you guys just 5 things you MUST do if you visit budapest. So if you love quirky bars with a chilled out vibe full of thousands of things to look at then Budapest definitely has something for you. Essentially the ruin bars started a few years ago it was kind of a way to dress up the bar using things available such as bikes, computers, street signs, hundreds of lights it's a really great idea. The one that I loved the most was Szimpla Bar, it's probably one of the most popular but it's pretty big and has a bit of something for everyone with the various different rooms to discover. There are a lot to discover though so I would definitely suggest that you go on a ruin bar crawl. Yeah yeah I know this is obvious but there is a LOT to see in Budapest, depends on how you want to spend your time but there are many ways to see the city. Fun fact : Budapest is actual split into 2, Buda on one side of the river and Pest on the other. Pest is pretty flat and Buda is the hilly part so go to Buda for the best views. Places like the Citadella and Fisherman's Bastion are pretty bloody high but you can totally walk up to both view points if you like a walk like I do. There are also pretty cheap boat tours that run down the Danube to Margaret Island and back which takes just over an hour, it's great because you get to see some of the sights and learn about the history. ...like Szécgenyi baths! There are a lot of baths dotted around Budapest but I think this bath house is probably the most popular and isn't it just bloody beautiful, think about the Roman baths in Bath but this is far more modern and you can actually just chill out in them! It's a super busy place but I think if you want to do something a little different you should visit here. There are two main baths in this complex on is about 30° and the other is 37° which is actually pretty damn hot when you get in! I would definitely say get a cabin instead of a locker, it just gives you space to get changed and sort your life out in your own privacy. Have you been on holiday this year? One of my favourite destinations in the world! Hungarian wine was really delicious and cheap too :) I'd also add in to go to House of Terror, an amazing museum experience about the fascist and communist times in Hungary. This is a really useful post! Noted down some of your tips and suggestions, I can't wait to visit the baths! !